Tamarind prawns or in this post, I am using shrimps is a staple menu in my home since I was small. Mom used to make tamarind fish, tamarind prawns, tamarind meats and whatever we can get our hands on because tamarind stores well. Back then, we don’t have refrigerator so any type of food that can last overnight is good. Tamarind pulp or asam jawa is this blob of ugly looking, brownish, sticking thing that makes food taste delicious. Due to it sourish taste, bacterias can’t grow, I suppose and spoil the food. There are restaurants and spas name Tamarind (Tree) and though they are expensive, classy restaurants or spas, the mention of tamarind reminds me of brown, sticky blob of sourish smell asam jawa. 🙂 Not to mention air asam for ikan bakar, assam pedas and my signature tamarind fish soup. 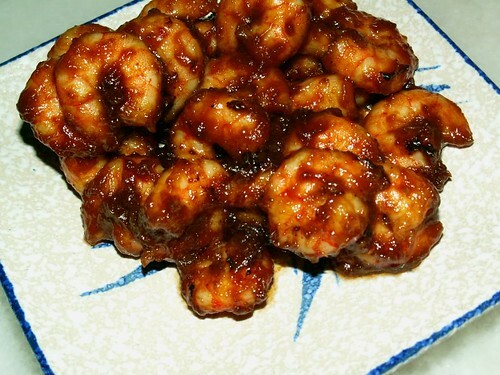 Ok, the recipe for tamarind prawns. Remember that when seafood comes into contact with tamarind, they tend to disintegrate (?) and turn mushy and overly soft.Ã‚Â Therefore, always refrain from seasoning and leave the seafood standing for too long.Ã‚Â However, if you have tough meats, you may season them with tamarind to make the meat less tough. Therefore, what you need to do is to have a quick, thorough seasoning and drop the whole thing into the wok. DO NOT put any oil at this juncture.Ã‚Â Leave the prawns to dry up a bit before adding oil because there is nothing worst than tamarind prawns with wet, gravy. 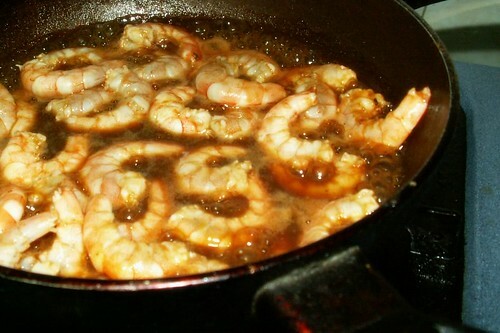 Once you add the oil, leave the prawns to fry till dry and fragrance.Ã‚Â You can either cook it extremely dry and nice or leave a little gravy to mix with your white rice.Ã‚Â Heavenly, either way. If you are using prawns with shell, do let them fry for a longer time.Ã‚Â Otherwise, dish up the shrimps when they are dry.Ã‚Â Do taste and adjust seasoning before serving.Ã‚Â Usually more sugar will bring out the taste in the tamarind prawns. Though the prawns look huge in the above photo, they are actually cheap, shrimps I bought from Tesco which costs a mere RM3.50 (RM9.90 per kilogramme, cheap sale! 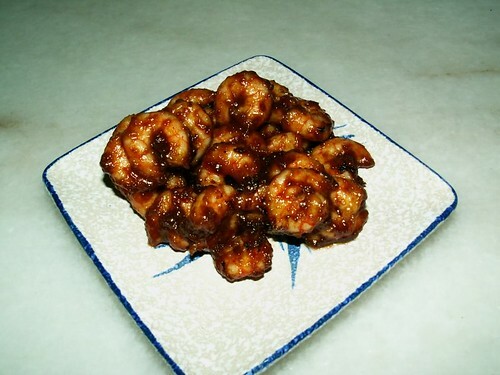 )Ã‚Â Prawns which are less fresh are suitable for making tamarind prawns.Ã‚Â Do not waste good, expensive, fresh prawns on making tamarind prawns.Ã‚Â Good prawns taste best on its own without the overpowering taste of tamarind. Yummy looking tamarind prawns from the restaurant.Ã‚Â Authentic tamarind prawns has only prawns and nothing else.Ã‚Â I usually do not order tamarind prawns from restaurants because they added in too many things like onions, ginger, spring onion which make it a chore to separate the prawns from the bulk of vegetables. This was one of the dishes I remember mum used to make for me when I was young. It was my favourite. But she used to make it drier with less gravy, merely coating the prawns lightly with the tamarind. Um…slurp! If u come to Sibu, we have the GIANT fresh water prawns around RM20-something a kilo, they’re excellent for assam prawns. Think I told u b4 about them – at a restaurant (now I’m not saying whose), they charge over RM20 for King Prawn noodles (2 miserable ones, cut in halves). maR – Senang aje. Ikan pun boleh goreng asam jugak. babe_kl – Each person got a different touch. I can never get the kind my mom made. STP – DOn’t tempt me with seafood from East Malaysia la. It will be a long time before I can afford to go again. Flight so expensive. MG – LOL, I always ended up with too ‘wet’ prawns. MY hubby also said that, he said my mother’s version better. I cheated and said the gravy is for rolling in the white rice to make ‘chap’ for the kids. Neo – When I open my own restaurant or catering service, ok? Charge you RM10 per plate. Rosa – Hope you get hold of tamarind to try them out.